Affordable Errors and Omissions Insurance Options for Insurance Agents, Agencies and Registered Investment Advisors (RIAs). Affordable Life & Health Agent E&O Insurance. Buy E&O Insurance in less than 5 minutes. Comprehensive Errors and Omissions Insurance Coverage for Property & Casualty Agents. E and O Insurance Coverage Options for Property & Casualty Agencies. Low Rates on Errors & Omissions Insurance Options for Life & Health Agencies. RIA E&O Insurance for Registered Investment Advisors. Get Insured 24/7. Real Estate Agent & Broker E&O — NEW! 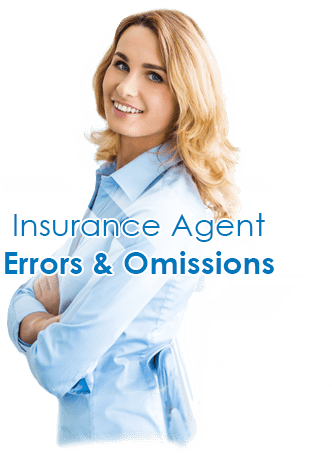 Errors and Omissions Insurance for Real Estate Agents Starts at Just $29 .08/month. Not due to Renew your errors and omissions insurance yet? Search Group Sponsored (e.g. Aflac) & Designation (e.g. ChFC) E&O Insurance programs. E&O Insurance for Life & Health Agents licensed 2 years or more.